As you already know, a number of people in my life have birthdays in August. Mom, Grandma, Uncle, my Friend the kitchens’ Taste Tester, my Friend the Entertainer, my Grand-Nephew, and the Oldest of the Boys Upstairs were all born in August. Well, in their honor, and since this is the last day of their collective birthday month, why not go out with a bang? 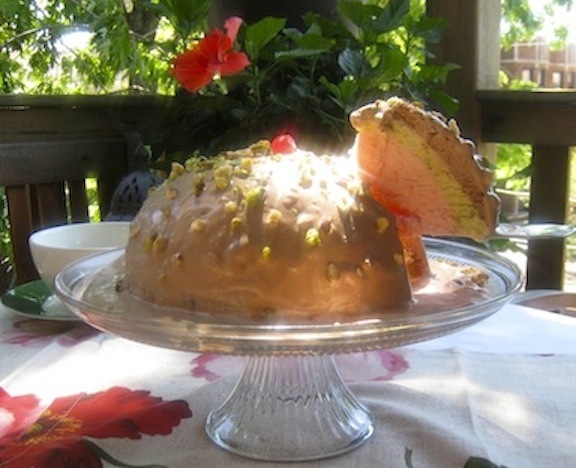 Today’s recipe is the Spumoni Bomba. These past few Fridays, I shared recipes for pistachio, chocolate, and cherry ice cream. Not so coincidentally, these are the 3 flavors used to create spumoni ice cream, Mom’s favorite. Dad often brought home boxes of spumoni from the restaurant, with each individual serving conveniently wrapped in paper. Klondike bars? 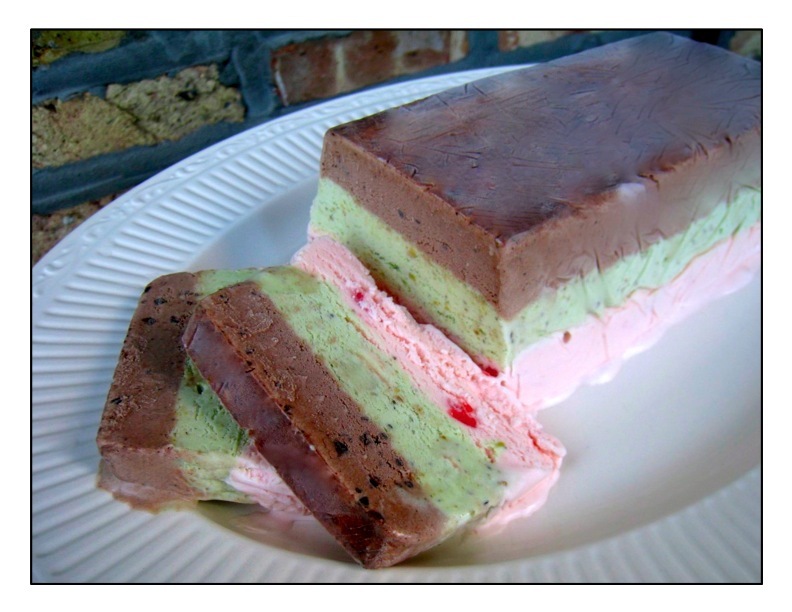 Who needed ice cream sandwiches when we had boxes of spumoni in the freezer? Anyway, if we’re going to celebrate the end of Mom’s birthday month, spumoni is the only way to go. Before offering instructions for creating the Bomba, as well as the traditional “loaf,” a few things should be mentioned. First off, I knew all along that I would be making spumoni ice cream and that’s why I chose to use the same base for all 3 flavors. I wanted all 3 ice cream layers to have the same creamy texture on the palate. Using a custard-based chocolate layer with a yogurt-based cherry layer and Mom’s pistachio layer, for example, just wouldn’t work. Secondly, “authentic” spumoni recipes call for a variety of candied fruit pieces to be added to the cherry layer. For me, these chunks do not freeze well and consequently ruin the texture of the ice cream. So, I dropped ’em! Moving beyond the rejected candied fruit, this recipe will use 3 batches of home-made ice cream, with each batch equaling 1 1/2 quarts. Of course, the amount of ice cream required will depend upon the size of the bowls you use to create the bomba. If you don’t wish to make home-made ice cream, store-bought can be substituted. You’ll need to let the ice cream soften a bit before you add any fruits or nuts, if desired, and before you use it to make either the loaf or bomba. Lastly, unless you have 3 canisters for your ice cream maker, this is going to take more than 1 day to create. Magic happens when you slice into a bomba! Special equipment: a set of 3 nested mixing bowls, each decreasing in size. Mine were approx. 10″, 8″, and 6″ in diameter, and/or 1 bread loaf pan. While the chocolate-chocolate hazelnut ice cream is being made, cover the exterior of the middle-sized bowl with plastic wrap, place it in the largest bowl, and place both in the freezer until needed. When the ice cream has been made, reserve 1 cup of it and pour the rest into the largest bowl. 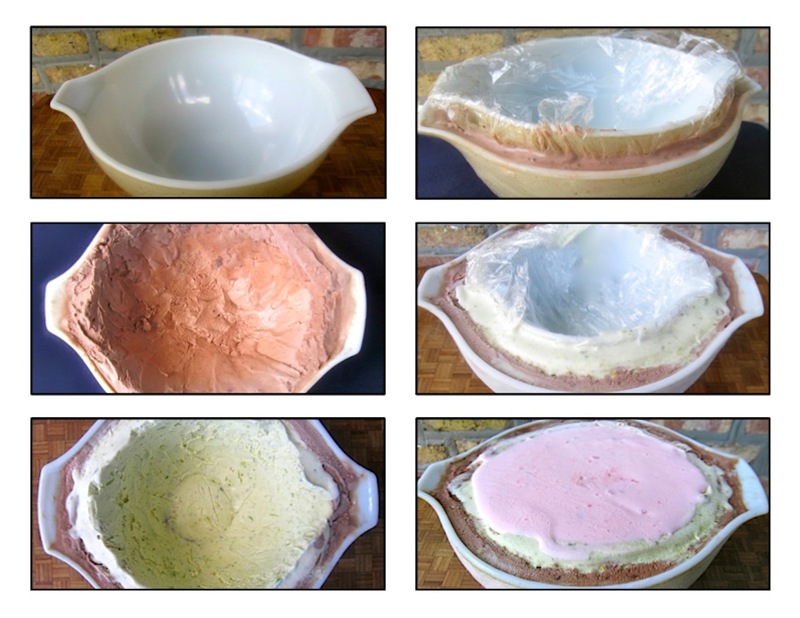 Place the plastic-covered middle bowl into the first and press down, causing the ice cream to flow upwards between the 2 bowls. Stop applying pressure when the ice cream reaches the top of the outer bowl. Place both bowls back into the freezer for a few hours. Remove the middle bowl and plastic wrap. With an offset spatula, use the reserved ice cream to fill any cracks that the plastic wrap may have created in the surface of the chocolate layer. Cover the ice cream-covered bowl with plastic wrap and return it to the freezer. As soon as the ice cream maker’s canister is ready, begin making the pistachio ice cream. Cover the exterior of the smaller bowl with plastic wrap and place in the freezer. Once the pistachio ice cream has been made, reserve 1 cup and pour the rest into the chocolate ice cream-covered bowl. Place the smallest bowl into the semi-frozen pistachio and press down, causing the ice cream to flow upwards between the 2 bowls. Stop applying pressure when the ice cream reaches the top of the chocolate-covered bowl. Place both bowls back into the freezer for a few hours.. Remove the small bowl and plastic wrap. With an offset spatula, use the reserved ice cream to fill any cracks that the plastic wrap may have created in the surface of the pistachio layer. Cover with plastic wrap and return it to the freezer. As soon as the ice cream maker’s canister is ready, begin making the Maraschino cherry ice cream. When completed, use the cherry ice cream to fill the remaining cavity. Cover with plastic wrap and place in the freezer until fully frozen. To serve, place the bowl in a hot water bath briefly while running an offset spatula or knife along the outer edge of the molded ice cream. If you wish to go the more traditional route and create a spumoni loaf, use a bread pan as your ice cream mold. Fill to 1/3 with chocolate ice cream and place in freezer until firm. Next, fill another 1/3 with pistachio ice cream and return to freezer until firm. Lastly, use cherry ice cream to fill the rest of the bread pan, cover with plastic wrap, and return to freezer until firm. When ready to serve, follow the same instructions for unmolding the bomba. Looking at the pictures, you may have noticed that the bomba’s cherry ice cream center is larger (thicker) than the other 2 layers. If you want your layers to be more consistent, you can either use a set of smaller bowls or make/buy more chocolate ice cream to form the outer layer. As it was, I used the entire quart-and-a-half batch made by my ice cream maker. As you also may have noticed, serving a bomba in a heat wave does have its risks and unless you’ll be dining in a walk-in freezer, you can expect some melting to occur. If possible, unmold the bomba onto an ice-cold serving platter and place it back in the freezer for a short while before serving. Pictured was a “surprise birthday bomba, ” the recipient of which, my Friend the Entertainer, didn’t mind “the thaw” one bit and even waited patiently for the pictures to be taken. This entry was posted in 1) RECIPES BY TYPE, Family Recipes, Sweets (Dolci), Vegetarian and tagged Dolci, family recipes, Food, Ice Cream, Italian by ChgoJohn. Bookmark the permalink. I like the way the sun is backlighting the just-sliced bombe in the manner of a religious experience. That pretty much sums it up for me regarding your ice cream creations. Truly serendipitous! We were rushing to get it plated, garnished, pictures shot, and presented on one of those “high heat” days — and Bea was helping. I was taking a bunch of pictures, hoping one would be good enough for the post, when the clouds parted and Voila! That’ll never happen again! Fanfare and fireworks here methinks for this grand finale! Amazing, it´s years since I´ve eaten anything like this and have never attempted to make one. Stunning photos too and what patience your Friend the Entertainer has …. holding back with something like that waiting for you?! Congratulations on a month of stunning ice creams. Thank you, Tanya. If you’re going to celebrate a month of birthdays, it’s either go big or stay home. Of course, now that the gauntlet has been thrown down, I’ve no idea what I’m going to do next August. Well, I’ve got a year to plan. AMAZING! What a finale! And what a great post, your efforts in making this and detailing the process is well noted! As well as that beautiful table setting. I LOVE spumoni! And totally homemade, wow! Thank you, Linda. The whole process was a lot of fun, from developing the cherry & chocolate ice cream recipes to presenting the bombe. And I, too, love spumoni — I am my Mother’s son, after all. I think, though, I won’t be blogging about ice cream for a while. I have a freezer full of rejected test batches to consume. It’s a tough job but someone has to do it.. Thank you, Cecilia. You echo the thoughts of the bombe’s recipient. Yet, he waited while I snapped pictures. Let that be a lesson for us all: choose your birthday boys (and girls) carefully, especially when bombes are involved. This is amazing but too frighteningly technical for a paysan like myself. I feel proud when I’ve made a single successful home made ice cream. I take my hat off to you. Thanks, Roger, but don’t sell yourself short. It really isn’t that difficult, if you’ve got the cream and freezer space — and it does take up a lot of freezer space! But, it is a worthwhile project, especially when the recipient is as appreciative as this bombe’s was. Wow! A standing ovation? Thanks, Mandy. This will surely be a hard act to follow next August. Enjoy your evening. This looks so good! Makes me want to pistachio ice cream right now! Thanks, Judy. I must admit it was very well-received, even if a little melted. I believe the sounds coming from my mouth were similar to Homer Simpson drooling. Well done sir! Wow! If you’re starting to sound like Homer, this recipe must be really good! Thanks for the comment and accompanying chuckle. This looks amazing! Everyone loves the first picture – and I do, too! – but your last photo truly sells me on this dessert! Look at those colors! You can see the cherries and pistachios and chocolate chips! What an advertisement! A job well done! Bravo! Thank you so much. It had been decades, literally, since I last enjoyed spumoni and this was such a fun project. Best of all was the look in my Friend’s face when he saw the bombe. Priceless! Glad to hear about the ice cream weather. I’ve got quite a bit of “test batch” ice cream yet in my freezer. And, with all my friends & family, thank you! What a beautiful photo. The ice cream looks absolutely delicious! Thanks, Eva. Using the same base for the 3 flavors of ice cream really did make a difference and both confections, loaf & bombe, were very well-received. It was a worthwhile project. Wow, wow, wow and about a thousand yums. “3 wows and 1000 yums from the Rufus Guide” such high praise and what an ad that would make! Thanks, Greg. Can you stand one more round of “Amazing!” ? ‘Cause it is, you know… And your how-to photos make it approachable. Absolutely wonderful! Tanto di cappello ( I take my hat off to you)!!! Really!!! Not only you came up with such a delicious and very elaborate ice cream recipe, your instructions are so well written that it seems so easy to make it. Exccellent! Thank you so much! The process itself really isn’t so difficult. You must have plenty of room in your freezer, however, to hold the bowls – empty & filled – and the ice cream maker canisters. And if you make it as a gift or for a special dinner, the look on the recipient(s) face(s) will make it all worthwhile. WELCOME HOME!!! Welcome, Betsy! 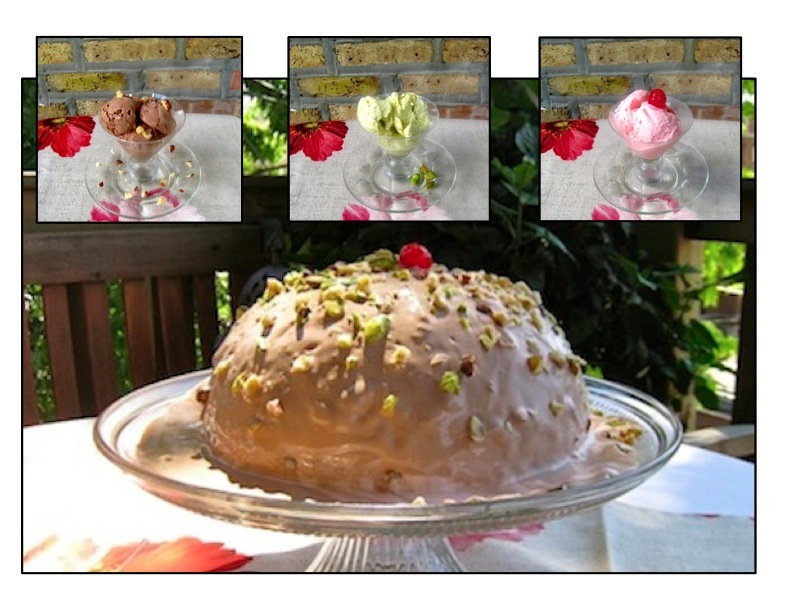 I got the idea for making a spumoni bombe, coincidentally, after seeing a sorbet bombe being served. I wanted to make something special for a friend’s birthday and this was perfect although, next time, I’ll use smaller bowls. That was an awful lot of ice cream! Thanks for your kind words and now I’m off to check out your blog. Don’t be a stranger! The pictures are wonderful! love the presentation oh the footed cake plate. Thanks, Ruth. It was such a hot day that afternoon and my friend was patiently “waiting in the wings,” not knowing what we were doing. Add to it, a young dog that was bound and determined to have some ice cream and it’s a miracle that we shot any pictures. All in all, though, it was well worth it. The look on my friend’s face, a real ice cram lover, was priceless. That’s one picture I regret not taking. OH MY! i missed this post. I have a very bad sweet tooth and this will give me much pleasure to indulge it. Once again you took a classic and sent it right over the top by improving upon every aspect. Extravagance of the most laudable sort!! This was one heckuva confection, Kathryn. You should have seen the Birthday Boy’s face when he saw it. I hope he doesn’t expect anything so grand this year. That bombe is a pretty hard act to follow! Wow, that’s amazing! I’ve never seen or heard of anything like this, looks absolutely delicious! It was quite a confection but, to be honest, I used nesting bowls that were too large. That thing contained well over a gallon of ice cream. It was huge! I gave it to a friend for his birthday and, frankly, was happy to get the monster out of my freezer! Thanks for dropping by and commenting. Oooh! That looks soooo good! I am used to eating my spumoni in squares too. I almost thing the waxed paper adds something to the taste for me! Thanks for sharing the recipe. Of course the square of spumoni was better. Real cream instead of carrageenan that is featured in those manufactured treats. You are so right! It is getting harder and harder to find cream that isn’t ultra-pasteurized and without carrageenan. Last Summer, when I was visiting family in rural Michigan, we went to an Amish store. I thought it would be a great opportunity to pick up “good” dairy for making cheese and ice cream. The dairy products were the same as those at the local groceries. What a disappointment! Yikes. Even the Amish? That does hurt. Dessert for the gang tomorrow! I hope you all enjoy it. Good luck! WOW! What a beautiful dessert!! THanks. It really was something and the Birthday Boy sure did enjoy it. Wow, what a recipe! The bomba is da bomb! I’ve never made a bomba, and I’m not sure if I’ll ever get around to it, but this sure is inspiration. Nor have I made my own spumoni, although that’s simple enough. I’m with you on the candied fruit, BTW – never saw the necessity for it. It just doesn’t add anything for me – kinda of detracts, actually. Great post – thanks. Thank you, John. Should you ever try your hand at making one of these, use bowls smaller than I did. That thing took more than a gallon of ice cream to create! My ice cream maker really got a work out. Being that large, though, was very impressive and the Birthday Boy was very happy. I’m so glad I found your recipe! I’ve been searching for a fantastic Spumoni recipe for some time. Not sure yet when I’ll make it – probably soon! Thanks. You are very welcome. I hope you enjoy it as much as we all do. Good luck! Serving a bomba in a heatwave is preferable to serving a bomba in winter. This is why, John, I’m holding onto this recipe a bit longer. But it looks delicious. Dear John, ‘Summer is a coming in, loudly sing cuckoo. Sing cuckoo!’ Actually it’s still spring, but Summer is getting closer. And – I have an ice cream, maker too, so I’m going to try your pistachio ice cream as well. Oh John, I know Christmas has just been and gone but I would give a small “King’s ransom” for La Bomba. I just love love ice cream but …….. hope you had a really nice ,”italian” Christmas. I hope 2017 brings good health and much joy to your home.